FriendGrief: "Love is in the Details"
The front page of the Chicago Tribune is generally reserved for hard news. And stories that begin “above the fold” are typically national or international in nature. But the story that began just under the masthead on Thursday, with a series of three photos, was very local. You could say it’s a little story. It has no earth-shattering implications for the economy or national security. It’s a story of friendship and loss, and the friends left behind. A year ago yesterday, Justyna Palka, an art director at Ogilvy & Mather, was struck and killed by a tour bus as she crossed a busy intersection in downtown Chicago. The bus driver has an extensive criminal record. He tested positive for cocaine and is awaiting trial for aggravated DUI and reckless homicide. Palka was 26 years old. Born in Poland and raised in Germany, Palka moved to Chicago in 2006 to study at the School of the Art Institute. She excelled at school and strove for perfection. “She couldn’t do anything halfway,’ said Karen Smith, her supervisor at Ogilvy & Mather. 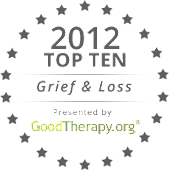 But in the months before she died, Palka had begun to focus on living a more balanced life, with an eye to her future. Within days of her death, Olivia Roszkowska left dogwood and hydrangeas at the corner where her friend died. At first, the flowers were left on the sidewalk, but they wilted and were swept away. That wasn’t acceptable. She asked permission from Palka’s mother to put up a bouquet, and tied it to the sign post. 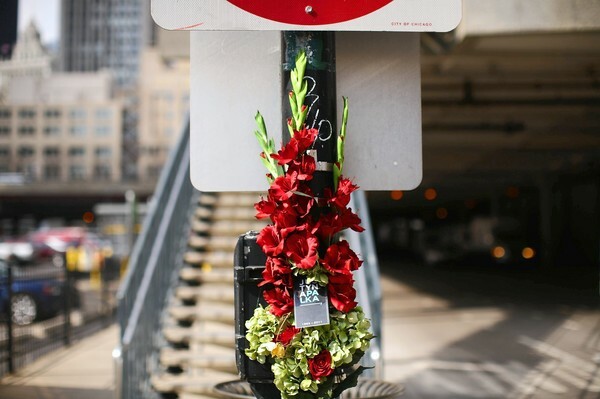 When the flowers faded, she replaced them with new ones, eventually with artificial ones that could stand up to Chicago’s unpredictable weather. Even as rain and snow replaced the summer sun, the flowers remained. Sometimes other objects were left: a small Santa statue in December and a cross at Easter. But Palka loved flowers, especially tulips, so that’s what her friends brought. Roszkowska flew to Germany this week for Palka’s memorial, which included the unveiling of a bronze statue. But first, she stopped at Columbus & Illinois. “It was 9pm by the time she arrived with an armful of silk orchids and roses. Cars zoomed past as she worked to attach the flowers to the street pole. Sometimes people will stop and talk, but on this night, she was alone. One of Justyna’s favorite sayings was ‘love is in the details’. It was true for her, and most definitely is for her friends.